Here at Clearway Gritting, we pride ourselves on being one of Hertfordshire’s top road and car park gritting companies. Much of our success relies on our readiness to respond to changes in the weather and our customer’s needs to grit their business parks, hospital car parks and pathways whilst also arranging snow clearance when required. We have been monitoring the weather forecast as “The Beast from the East” approaches with freezing temperatures and potential for heavy snowfall and even blizzard conditions all originating from Siberia. 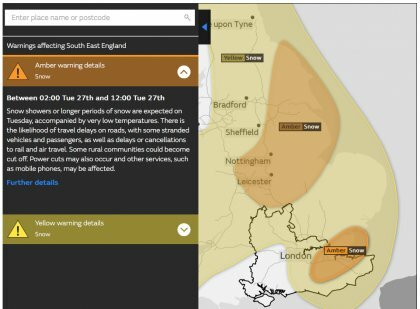 The BBC Weather Website is quoted as stating “Snow showers or longer periods of snow are expected on Tuesday, accompanied by very low temperatures. There is the likelihood of travel delays on roads, with some stranded vehicles and passengers, as well as delays or cancellations to rail and air travel. Some rural communities could become cut off. Power cuts may also occur and other services, such as mobile phones, may be affected”. We are on standby with our team of 70 Snow Ploughs plus our Gritting Lorries & Vehicles to help keep your roads, pathways and car parks clear of snow and ice and safe to use. Don’t delay! Give us a call on 01727 851837 and we can help to organise your site to be on the gritting and snow clearance schedules.